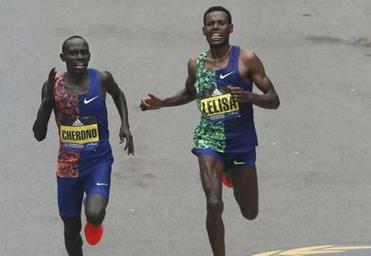 Boston Marathon spectators watched with bated breath Monday as Lawrence Cherono of Kenya captured the men’s title in a near-photo finish, beating the next runner by just a couple of strides in one of the most dramatic conclusions to the men’s race in years. Cameran Schwarz, 19, a Boston University student, was nearly brought to tears as she watched Cherono and second-place finisher, Lelisa Desisa Benti, of Ethiopia, make their final, desperate sprint toward the finish line of the race. Klodian Mitri, who was also positioned near the finish line, said the final moments left many fans speechless. Where does this rank among the Marathon’s closest finishes? The sprint to the finish by Lawrence Cherono and Lelisa Desisa was dramatic, but it wasn’t the closest finish. The exciting finish was just one of the memorable moments of the iconic race, which draws tens of thousands of runners from around the country and around the world, who stream down the 26.2-mile course into Boston, while throngs of enthusiastic spectators cheer them along. In the women’s elite race, Worknesh Degefa of Ethiopia captured the women’s title. Earlier in the morning, Daniel Romanchuk, 20, crossed the finish line first in the men’s wheelchair division around 10:23 a.m., making him the first American to win in that division since 1993. Manuela Schaer of Switzerland won the women’s wheelchair race in an unofficial time of 1:34:19. She also won the Boston Marathon in 2017 in a world and course record time of 1:28:17. Some spectators came out to do a little stargazing. One celebrity from the world of sports who crossed the finish line to the delight of fans was NASCAR driver Jimmie Johnson. “I’m hurting, but it was a lot of fun and just an amazing experience,” Johnson said, adding that there were many highlights during the race. He said he liked that the runners could feed off the energy of the crowd. Around 7:30 a.m., Hopkinton Police Chief Edward Lee told reporters that the severe weather had forced several buses of runners to “shelter in place” while traveling between Boston and the start of the race in Hopkinton. But while the weather posed challenges, public safety officials said there was no credible threat to the race. Susan Berry Cann, 61, of Danvers, a nurse practitioner at St. Elizabeth’s, was volunteering at her sixth Boston Marathon. “Once you do it, you realize how awesome it is,” she said. On the race route near Wellesley College, throngs of students cheered, holding signs with an eclectic mix of slogans including, “Kiss me, I build robots,” “Kiss me if you’re chaffing,” and “I like your stamina. Call me.” Some runners stopped for friendly smooches. The decades-old “Kiss Me” tradition is a core part of Wellesley’s legendary “scream tunnel,” in which students line the halfway point of the race to loudly urge the competitors onward. But some of the spectators this year sent a different message: Don’t kiss me. And it wouldn’t be Marathon Monday without a couple tying the knot at the finish line. This year, Tyler Greathead, 27, proposed to his girlfriend, Sarah Lieneck. The couple, surrounded by cameras and iPhones raised aloft, embraced after Lieneck said yes. Monday’s race fell on the sixth anniversary of the 2013 terror bombings that killed three people and wounded more than 260 others. New York Police Commissioner James P. O’Neill paid tribute to the victims in a Twitter message. He posted photos of Martin Richard, Lingzi Lu, and Krystle Campbell, the three spectators killed in the blasts, as well as MIT Police Officer Sean Collier, who was fatally shot by the bombers a few days later, and Boston Police Officer Dennis Simmonds, whose 2014 death was attributed to a head injury he suffered during the manhunt for the terrorists a year earlier. And along the race route Monday, a moment of silence was held at 2:49 p.m., the time when the deadly attack occurred. Globe Correspondents Jenna Ciccotelli, Greg Levinksy, and Sophia Eppolito and Emily Sweeney, Matt Pepin and Rachel G. Bowers of the Globe Staff contributed to this report.